Ecdesign let's anyone create 3D interior designs without having to use complexed CAD software. ECDESIGN Sweden, a Swedish software provider specializing in 3D room & floor plan software, announced today the release of Ecdesign 4.7. The new software version includes support for the Oculus Rift virtual reality headsets. 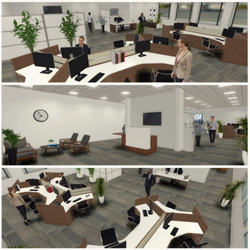 Ecdesign users can experience the finished floor plan in immersive VR. Ecdesign was first launched in 2004. Today the software is used by over 15.000 organizations in 115 countries. The software was specifically designed to be used by people working in sales. Ecdesign let’s anyone create 3D interior designs without having to use complex CAD software. Instead Ecdesign uses the latest gaming technologies to make planning fast and easy. On the launch of Ecdesign 4.7, Ecdesign CEO Richard Grönberg said, “We have created the most user-friendly space planning software on the market and now our users will be able to actually take a walk inside the finished floor plans using virtual reality. Ecdesign 4.7 also includes a new SketchUp model importer. This means our users can now import millions of free models into Ecdesign. Ecdesign is the industry standard for business selling fitness equipment and automotive repair shops. We expect many more industries will choose Ecdesign, now that we have the new SketchUp import “. Ecdesign let’s the user create the entire floor plan in top view 2D and the finished result can be visualized instantly in real-time 3D. You create selling floor plan presentations in just a few minutes. Presentations that normally would take experienced CAD designer days to complete. “Our software targets people who is looking to create multiple layout proposals to customers each week. Many of our users plan the layout together with the customer and any revisions can be made without any delay. Ecdesign is used to create millions of designs each year. Most repair shops and commercial gym locations are now design with Ecdesign. With the launch of Ecdesign 4.7 we think customers active in markets such as furniture, retail, real-estate and manufacture ring will also be attracted to start using Ecdesign.